The Cermetek LeafMon System provides the grower with a physical measurement of water stress in a plant. Crop Water Stress Index (CWSI) values range from 0.0 to 1.0. The higher the CWSI value, the greater the level of water stress present in the plant. See Figure 1. The avocado grower must establish a range of CWSI values that support good health in the Avocado trees. The LeafMon System measures water stress in the tree as the water level in the soil is manipulated. For the LeafMon to serve as a useful tool for the avocado grower, the grower must learn how his avocado trees react to changes in the CWSI. This is accomplished by exposing a monitored tree to both low and high levels of water stress. Observing and evaluating the tree’s response is critical to establishing a range of water stress levels that the avocado tree can safely endure. 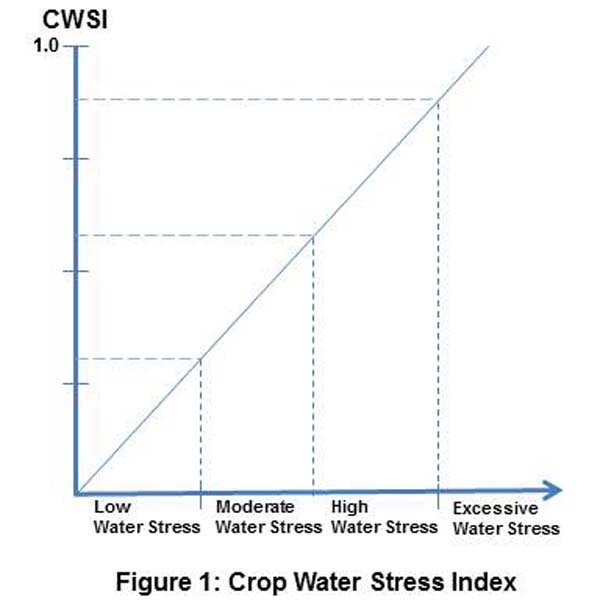 Once the Crop Water Stress Index range has been established, the CWSI value becomes a metric for the grower to manage irrigation timing, to increase water use efficiency and to improve crop sustainability. It has been Cermetek’s experience tht plants react to changes in water stress levels differently during the various phases of the plant’s growing cycle. For example, the level of water stress an avocado tree can accommodate during the fruit fall phase may cause damage to the crop during the flowering phase. It is important to continuously update the range of CWSI values throughout each phase of the growing cycle and to monitor the effects of water stress on the tree throughout each phase. The procedures described herein assume the use of only one crop water stress monitoring station. Employing additional monitoring stations increases the grower’s flexibility when dealing with weather and associated temperature/humidity variations encountered throughout the season and from season to season. This holds especially true for orchards with significant soil and terrain variations. Multiple CWSI monitoring stations allows for more precise tuning of the irrigation schedule to more accurately match the variations within the orchard. The Cermetek's LeafMon utilizes proven state-of-the-art non-contact, non-invasive, non-destructive sensor technology placed a safe distance from the leaf. Their presence causes no harm to the leaf and does not alter the plant’s function. The LeafMon Sensor Suite has been engineered to allow for easy upgrade of individual sensors should the sensor technology advance. LeafMon is fully inter-operable and will connect to most commercially available controllers equipped with a standard SDI-12, RS232 or RS485 interface. Dirt, moisture, wind, humidity, temperature and UV Radiation are not a threat to LeafMon's sensors or its performance. The LeafMon Sensor Suite never needs to be calibrated. The data from ALL sensors are used by LeafMon to calculate CWSI. Cermetek's AquaMon Remote Access Node is also fully inter-operable. Virtually any commercially available sensor can be connected to the AquaMon Controller. AquaMon will interface with standard SDI-12, RS232 and RS485 sensors as well as a maximum of 8 analog/digital I/O sensors. Additional daughter boards may be attached to the basic controller to provide additional sensor ports. The basic AquaMon Controller is supplied with an embedded GPRS RF cellular link providing Internet access. Remote AquaMon Nodes may also be connected via a 151MHz RF linked to a centrally located AquaMon Node operating as an Internet Hub. AquaMon may be powered by either an AC to DC converter (backup battery option recommended) or by a solar panel (backup battery required). An AquaMon Weather Station unit (utilizing the basic AquaMon Controller) is also available. Each CWSI Monitoring System consists of one AquaMon Agriculture Remote Sensor Node and one LeafMon Sensor Suite. LeafMon Crop Water Stress Sensor Suite. AquaMon Agricultural Remote Sensor Node. AC powered (using an AC to DC power supply – backup battery and charger optional). DC Battery (with a solar panel and battery charger). Access to Cermetek’s Internet based RSVP (Remote Sensing Viewing Platform). RSVP is a web based product. The AquaMon Agricultural Remote Sensor Node connects to the Internet through an embedded GPRS RF cellular link. Individual password protected RSVP accounts are accessed via the Internet using a smart phone, laptop or desktop running any commercially available web browser. Access to CIMIS Local Weather station (or alternate sources of) Evapotranspiration data. Access to Soil Moisture Sensor data. Proper installation of the LeafMon Sensor Suite is essential to achieve actionable crop water stress values. Complete the following steps for proper installation. Step 1: Select the Location of the LeafMon Sensor Suite. 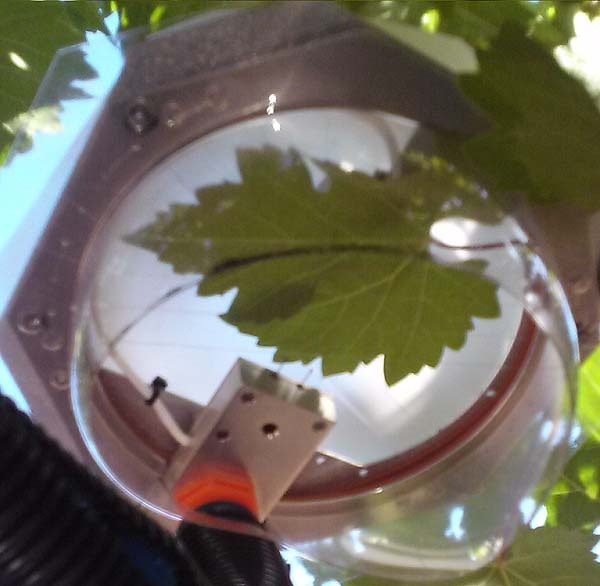 The LeafMon Crop Water Stress Sensor Suite monitors one leaf on one tree. The selected tree will represent the entire orchard. CAREFUL selection of both the tree and the leaf is critical. The monitored tree must be healthy. Any pests or disease present in the tree could distort water stress readings. Conditions such as slope and soil type also affect how quickly the tree enters water stress. Lastly, the monitored tree should be located in the fastest drying area in the orchard. This insures that the water stress on other trees in the same irrigation circuit/zone will not exceed the water stress of the tree being monitored. Step 2: Install the LeafMon Sensor Suite. Attach the LeafMon Sensor Suite to a mature leaf in a shaded area of the selected tree’s foliage. Select a leaf high in the canopy to allow for a more accurate calculation of water propagation time (i.e., the time it takes for the soil moisture to reach the tree’s upper canopy). Mounting the LeafMon sensor on a shaded leaf provides more reliable data than a leaf exposed to direct sunlight. Step 3: Install the AquaMon Remote Sensor Node. The AquaMon Agricultural Remote Sensor Node collects data from the LeafMon Sensor Suite and provides communications to the RSVP web server. Install the AquaMon Remote Sensor Node close enough to the LeafMon Sensor Suite to connect with no more than 20 feet of cable. If battery power is used, mount the solar panel such that it receives direct sunlight for at least two hours per day to recharge the internal batteries. Reposition the cellular antenna, as required, to maximize cellular connectivity. Knowing how the crop reacts to various Crop Water Stress Index levels allows the grower to use CWSI as an irrigation tool. Learning what levels of CWSI are harmful to the tree or crop and what levels are beneficial allows the grower to utilize CWSI values to manage crop water stress through his irrigation practices. Keep in mind that the range of acceptable CWSI values corresponding to each plant stress category may vary throughout the growing cycle. Step 1: Determine Low Water Stress CWSI Value. After LeafMon installation, it is necessary to establish the Low Water Stress CWSI value (see Figure 1). Cermetek recommends monitoring the CWSI value for three to four weeks while following existing irrigation practices. The lowest level of CWSI observed during this period will serve as the reference value for water stress in the tree. Step 2: Determine Irrigation Latency and Moisture Propagation Time. While monitoring Crop Water Stress Index to determine the Low Water Stress CWSI level, the grower should calculate the time for soil moisture to reach the canopy. This is called the Moisture Propagation Time and it is the difference between the time at which peak soil moisture level occurs and the time the lowest CWSI value is observed. Additionally, the grower should determine the time it takes the soil to reach peak moisture levels once irrigation has begun. This time is called Irrigation Latency. Irrigation Latency and Moisture Propagation Time are important parameters to know when managing irrigation schedules to maintain specific ranges of CWSI values within the tree. Step 3: Determine Excessive Water Stress CWSI Value. To determine Excessive Water Stress CWSI values, the growers needs to intentionally place the tree into a water-stressed condition. This is accomplished by irrigating the monitored tree to 90% of the Evapotranspiration (ETc) value while continuing to irrigate at the same frequency. The appropriate ETc value is obtained independently from CIMIS Local Weather station data, local weather stations or other alternate sources. The reduction in water will eventually put the tree into a stressed state. Note that the Excessive Water Stress CWSI value (see Figure 1) may change throughout the growing season. Consequently, the grower needs to repeat the above procedure during each of the different phases of the growing cycle to determine the Excessive Water Stress CWSI value for each of the phases of the crop growing cycle. When testing for the Excessive Water Stress CWSI value, it is important to closely observe the tree for any indications of water stress. When outward effects of water stress are observed, the CWSI value attained at this point in the procedure represents the Excessive Water Stress CWSI value. The Excessive Water Stress CWSI value serves as the upper limit of water stress allowed for the trees during a particular crop growth phase. After observing the water stressed state, resume irrigating to 100% ETc until the CWSI drops safely below the Excessive Water Stress value and outward signs of water stress are not observed. With the Low Water Stress CWSI (i.e., the lower CWSI limit) and the Excessive Water Stress CWSI (i.e., upper CWSI limit) values established for the crop, the grower has successfully determined the water stress limits required to safely maintain the tree within an acceptable range of water stress. Crop Water Use Efficiency is, essentially, the crop yield per amount of water applied to the crop. Knowing the maximum and minimum CWSI limits for the various phases of the crop growing cycle, the grower has the ability to place the tree into a “controlled” water stress condition during select phases of the crop growing cycle. This practice is generally referred to as Strategic Deficit Irrigation. By way of example, it is known that almond trees benefit from higher levels of water stress during hull-split as it prevents hull rot from damaging the crop. It is to be expected that there will be a tradeoff between controlled water stress and crop yield. Increasing water stress during some phases of the crop growing cycle will likely decrease crop yield. However, crop water stress can be managed to minimize crop yield loss while significantly reducing water usage. Using CWSI values to manage crops via a controlled water stress strategy, the grower can increase Water Use Efficiency and improve crop Sustainability. It is recommended that the grower further experiment with various irrigation parameters to fully understand how the level of water stress affects crop yield and tree health throughout the growing cycle. Minimize water usage (without causing long term harm to the crop). Attain a combination of goals (such as maximizing crop water use efficiency and maintaining/minimizing yield loss). By monitoring CWSI values and observing overall tree health, the grower can determine when the avocado tree can be safely put into a more highly stressed condition thereby saving water and increasing crop water efficiency. This can be achieved without a significant impact on yield or adversely affecting long term tree health.